DECLAWING CATS — Veterinarians have performed surgical declawing without question on hundreds of thousands of cats at the request of owners who find their cats’ natural marking behaviors to be too destructive to home furnishings. Doctors did this mutilating and excruciatingly painful surgery without recognizing and acknowledging that they created severe pain in their patients; since cats are superb at hiding their suffering even from doting owners (thanks to their evolutionary need to hide all disability from potential predators), we have allowed ourselves to think that this is a benign procedure for the victim. However, thanks to my profession’s developing an increasingly empathetic practice philosophy in the last generation and thanks also to our advancing knowledge of the physiology of pain, veterinarians around the world now eschew this surgery, and many countries have made it illegal to perform feline declawing since the procedure violates their anti-cruelty laws. …veterinarians around the world now eschew this surgery, and many countries have made it illegal to perform feline declawing since the procedure violates their anti-cruelty laws. Declawing involves the amputation of the last bone in the five toes of each forepaw. Post operatively, the patient has the likelihood of experiencing ten sources of the lifetime of “phantom pain” that plagues human limb amputees. As a result, many cats develop litterbox avoidance since scratching the litter is painful, and multiple studies have shown that, with their “first defense” weapons no longer available, the potential for biting behaviors increases. For this reason, all of the national and international health organizations recommend that cats belonging to immunocompromised patients must not be declawed, since their studies show that biting behaviors increase in declawed versus intact felines. A partial list of these organizations include the Center for Disease Control, World Health Organization, National Institute of Health, and Infectious Diseases Society of America. 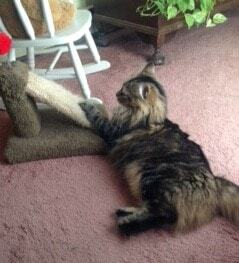 With a combination of proper nail trimming every month, proper scratching posts with the cat’s preferred materials (sisal, carpeting) placed in the proper location, plus the use of “soft paws” and consistent behavior modification, it is very possible to have your Kitty and your Great-Aunt Agatha’s heirloom couch too! A dwindling number of veterinarians (including the New York State Veterinary Medical Society) argue that declawing is benign and should be offered to owners. They defend their position by erroneously claiming that health officials recommend it (see above) and by claiming that refusing to perform this procedure will result in an increased number of cats being dumped in their local shelters. Once again, they are not keeping up with current studies: five municipalities in California have documented no increased relinquishment of cats to the shelters since they instituted their ban on declawing, and shelter adoption rates for their feline guests have risen. Visit The Paw Project. NYSHA’s VP Dr. Holly Cheever is also a member of their board of directors. 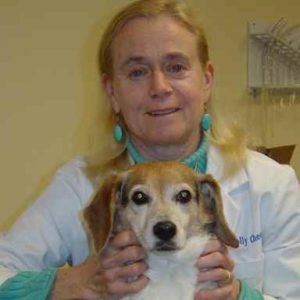 NYSHA’s VP, Dr. Holly Cheever, is a partner in a small animal practice, the Village Animal Clinic, in Voorheesville, NY. She sits on several boards for animal issues, is a speaker and consultant across the nation, and has testified before Congress about animal abuse in circuses, as well as in New York City regarding the carriage horse trade. New York State Humane Association Humane Review, Vol.XXXII Winter/Spring 2018.